I went to the Big Iron Classic in Kasson MN a month ago already (little late on the pics, been busy) and saw quite a few Macks. This is held in a small town just west of Rochester and it is a great show. It was said that there were 500 trucks there this year. This is a non award show so alot of really cool trucks show up. Everything from show trucks to stuff that just got pulled out of the weeds. Lots to look at, great show. Here are the Macks that were represented at Waupun this year. I especially liked the green and white R-model. Sharp looking truck. Was a good show all around. We had our local ATHS meeting yesterday. Had some great weather and a good turnout with a nice mix of trucks. 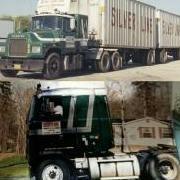 Followed a couple Macks out there, would drive mine but its in pieces on the garage floor, so I took the Pete.